I’ve recently started using cheap metal hooks to add a bit more utility to some of my buckets. I got these hooks from Home Hardware. They were $1.50 each. I spotted some really overpriced towel hooks up near the front of the store for 4 times as much, but I stubbornly went straight to the bulk hardware section and found these bad boys. They are iron with nickel coating, and are stronger than my needs. My hooks came with wood screws only because they are designed for screwing into a wall. So I picked up some 1/8″ stove bolts, which came with both bolts and nuts. You can see how I fastened the hooks to the bucket below. A thin plastic wall does not make the best gripper for a hook. If you mount a hook on a bucket without providing any backing, the hook will be “droopy” and the bolt will eventually tear through your bucket. To provide grip on my hooked bucket, I’ve put a plate behind to securely fasten the hooks. 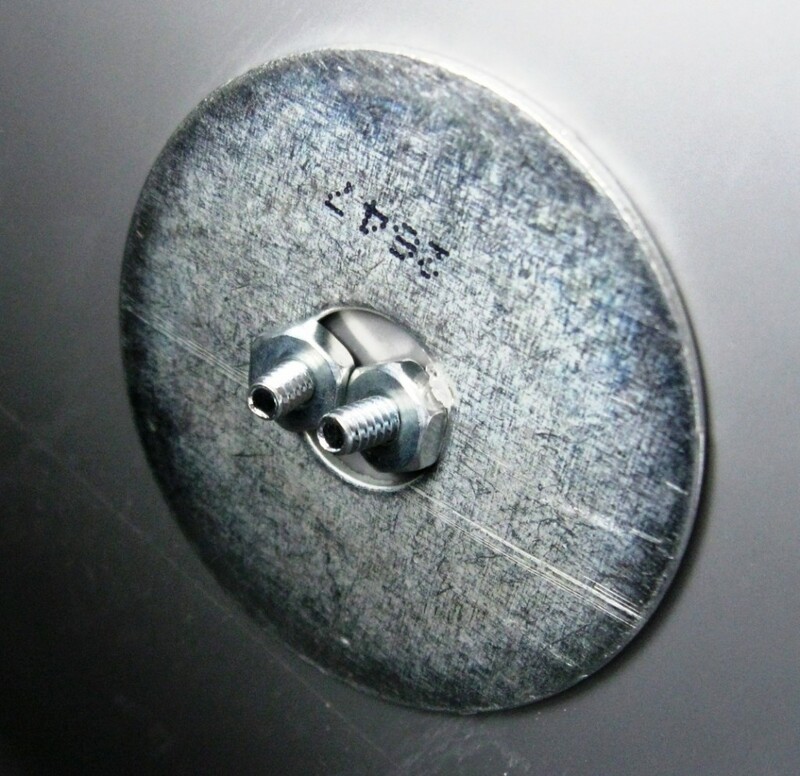 This ensures that the hook has an effective gripping surface area of a few square inches, instead of just a surface area the size of my tiny bolts. This plate is actually just a 49 cent washer. I got one with as wide of a diameter as possible, and the right sized hole to fit both bolts securely. This flat washer grip may not work with a round bucket, I’ll have to test to see. You could also stick a piece of wood inside the bucket and drive wood screws right into that. That’s a trick I use all the time to fasten to thin plywood. I’ve thought of a few uses for combining hooks to buckets. 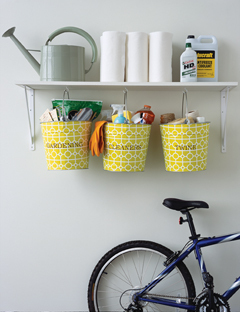 You could put together a sort of “picnic bucket” where hooks hold cups securely in place. 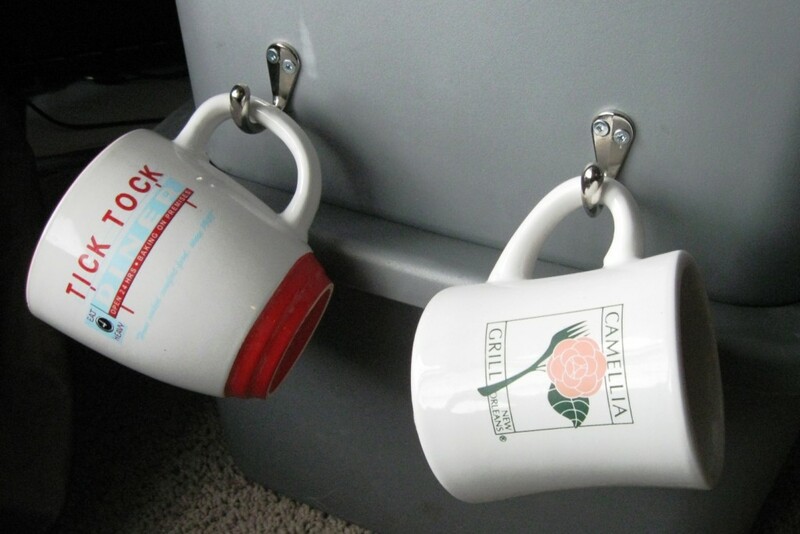 If the hooks are mounted on the inside near the lid, you can actually make it so fastening the lid on the bucket will also secure the mug handles in. 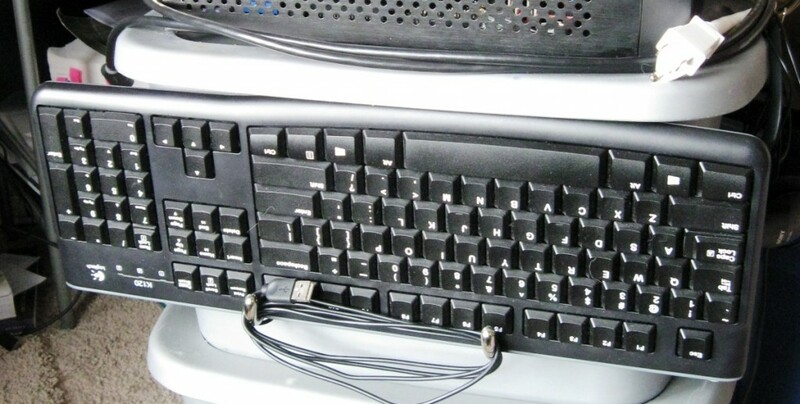 But I’m not using these hooks for holding mugs, I picked these up because I needed a holster for a keyboard. I made sure that the hooks were the proper size before I bought them. Measure twice! 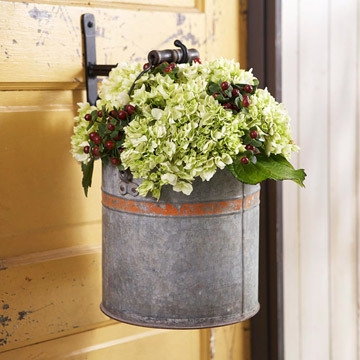 You can also flip this idea over and use a hook to hang a bucket. 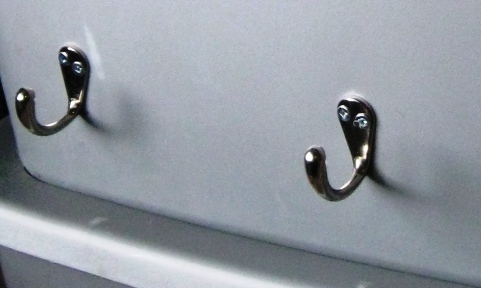 These hooks are the perfect size for a bucket handle to slip right in. Some people like to use them to get storage space on both sides of a shelf. I’m sure you’ve seen hanging plant baskets around. They’re very popular with small space gardeners. All they are is a bucket planter coupled with the right hook. For heavier loads, I love bicycle hooks. They’re designed to hold bicycles by their wheels so are rated for significant weight. And they’re rubberized which make them more attractive and prevents scratching and chafing which is more likely with heavy loads. 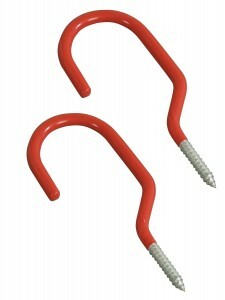 These particular hooks from TEKTON are rated at 60 lbs. That’s perfect for a bucket, which has a max weight of 40 lbs when filled to the brim with liquid.